Upgrade your hold music for legacy phone systems! The Ohvo On-Hold Player is an easy to use digital music on hold system that utilizes standard USB flash drives for message transfer. Use professional hold music with your legacy PBX system and give your callers something nicer to listen to! Ohvo can create professional hold music and messages to accompany this unit, so get a package deal and start sounding more professional with your phone system today. Fail-safe playback – Automatically plays files off a USB drive when inserted. When USB drive is removed to change messages, the unit plays a built-in generic music on hold message. Media storage – Supports up to a 16GB flash drive. Test speaker – Built-in test speaker with push on/off switch. 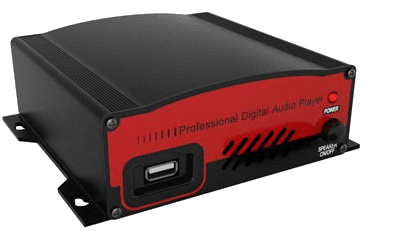 Dual audio outputs – It plugs into your PBX music on hold jack. READY TO GIVE YOUR CALLERS SOMETHING BETTER TO LISTEN TO?